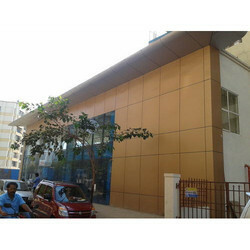 We are offering Aluminum Composite Panel Service to our clients. Being one of the leading providers of this Aluminum Composite Panel Service, we never compromise with its quality. Thus, we offer the service as per the set industry norms and guidelines, utilizing the finest resources available to us. Further, the offered service facilitates paneling and for making curtain walls, in the most commendable manner possible.